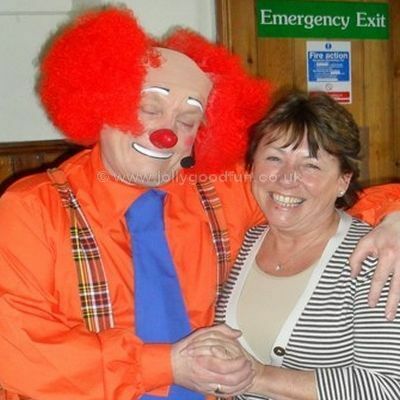 Chuckle The Clown is available to hire for Family Fun Days, Corporate and Community events in Yorkshire, County Durham and the North East or a birthday party within 15 miles of Richmond, North Yorkshire. Chuckle The Clown is an authentic clown with a "red nose", "red hair", "baggy trousers" and "great big shoes" just like a real circus clown. 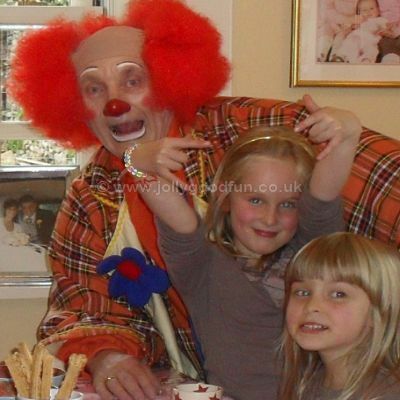 Chuckle the Clown can entertain at your Birthday Party, Christening, Family Fun Day, Store Opening or Event of any kind. Chuckle The Clown is multi skilled and can perform circus tricks, clown magic, balloon modeling and either set piece or improvised gags and routines. 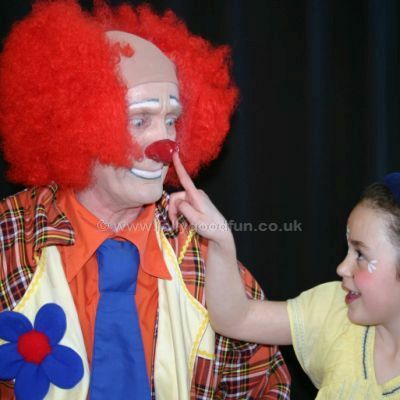 Chuckle the Clown is the perfect Children's Entertainer for your child's Birthday Party. lots of tricks and gags to make the children laugh. funny juggling and circus antics. stuff that falls over, drops off or breaks accidentally. After the party food Chuckle provides a further thirty minutes of entertainment until it's time to go home. You can be sure a visit by Chuckle is going to be very exciting. Chuckle The Clown is wonderfully entertaining for children at any event. His presence will help to create a party atmosphere. Perform hilarious thirty minute Clown Shows. Entertain on the move with pocket tricks and gags. Entertain everyone with mime, mimicry, slapstick and improvisation. Interact with all ages to create happiness and fun. meet and greet people as they arrive. mix and mingle performing tricks and gags on the move. show people how to juggle or spin a plate. do funny stuff with balloons. Clowns are not just for kids! 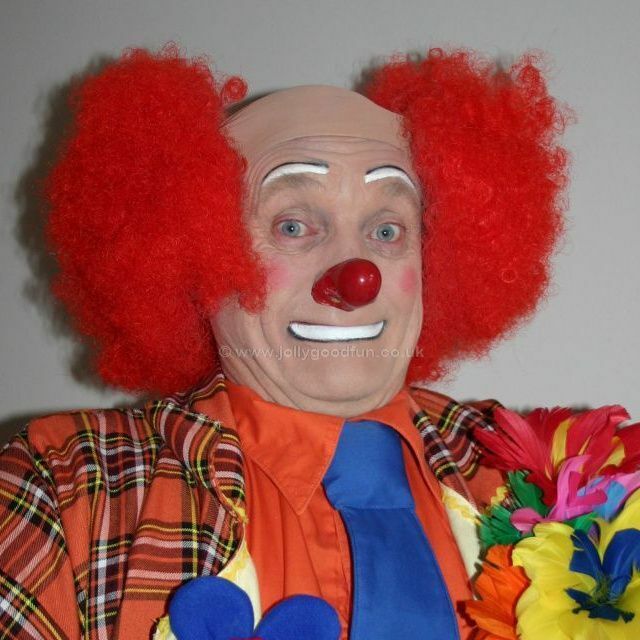 The antics of Chuckle The Clown will help to make your event memorable and fun. Chuckle The Clown looks just like a proper circus clown. His clown costume ( known as "motley" ) and clown makeup ( which clowns refer to as "slap" ) are just what you imagine a clown in a circus to be. Mr Chuckles will bring a smile to everyone's face just by being at your event. When Chuckle The Clown interacts with the public there is going to be lots of fun and laughter. Chuckle The Clown can do set shows or entertain people on the move. He has plenty of tricks and gags up his sleeve to entertain young and old alike. No Family Fun Day would be complete without a clown to entertain the children. Chuckle is ideal to greet guests as they arrive at the event. Chuckle The Clown can entertain children and adults as a walk about act performing mix and mingle style entertainment. Chuckle can work indoors or outside ( weather permitting ). Children love to make friends with Chuckle. Chuckle at a birthday party near Leyburn, North Yorkshire. This lady at a party wanted a great big hug from Chuckle.